It can be impossible to predict ahead of time whether or not you will be delivering your baby via cesarean section. 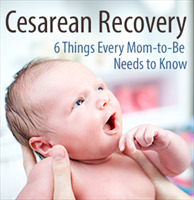 Therefore it’s important to arm yourself with the facts about cesarean birth and recovery before you go into labor. That way, if you end up being one of the approximately 20 percent of mothers who give birth by cesarean section, you’ll have an idea of what to expect on the recovery front. Here’s what you need to know. 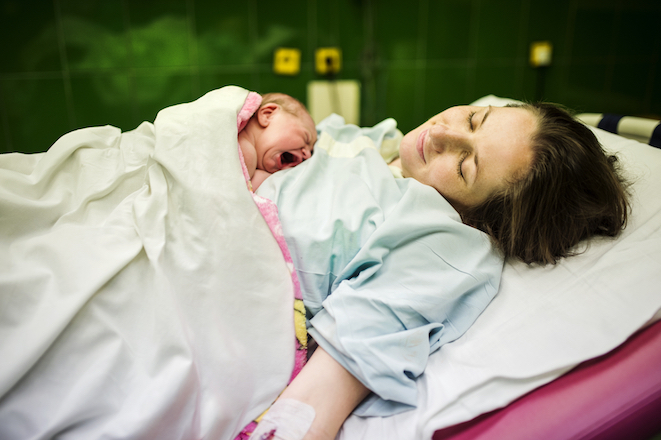 It takes longer to bounce back after a cesarean delivery. A cesarean section is major abdominal surgery. Consequently there’s a fair bit of healing involved. In fact, it takes approximately six months for your incision to fully heal. You can expect to feel some numbness in the area until your nerves have a chance to regenerate (something that typically happens six to nine months after the delivery) and you should be prepared for some initial itchiness as well. It’s normal to experience pain around the incision site during the early weeks after the birth. You can minimize your discomfort by using a pillow to support your midsection when you cough, sneeze or laugh; wearing tight bicycle shorts underneath your regular clothing; avoiding heavy lifting; and limiting the number of times you trek up and down stairs in a day until your incision starts to heal. It’s also a good idea to line up some help for when you come home. After all, you don’t just have yourself to take care of while you’re recovering: you’ve also got that new little bundle of joy. You may experience painful gas pains. Gas pains tend to occur during the first three days after the delivery, easing up as soon as your intestinal tract starts working again. Taking short walks, changing your position frequently and rocking in a chair will help to get rid of any trapped gas, thereby helping to reduce the intensity of the gas pains you’re experiencing. You may have trouble urinating at first. You may experience pressure and discomfort while urinating within the first week or two of the delivery. It’s a side effect of your surgery and will disappear as your body begins to heal. You may have to get a little creative when it comes to breastfeeding positions. Consult with a lactation consultant or other breastfeeding expert if you’re having trouble finding a comfortable nursing position. As a rule of thumb, the side-lying position and the football hold positions work best because they help to keep your baby away from your oh-so-tender incision site. You face an increased risk of experiencing postpartum depression. Giving birth via cesarean section puts you at increased risk of developing postpartum depression — a condition that affects approximately one in five new mothers. If you find yourself exhibiting any of the classic symptoms of depression, you will want to seek help from your doctor. The prognosis for recovery is excellent, but it’s important to seek treatment early. It’s also important to keep in mind that you will also experience the usual laundry list of postpartum aches and pains — except, of course, for perineal pain. (At least you got off lucky in that department!) So make a point of getting some extra rest during the early weeks postpartum. You deserve it.